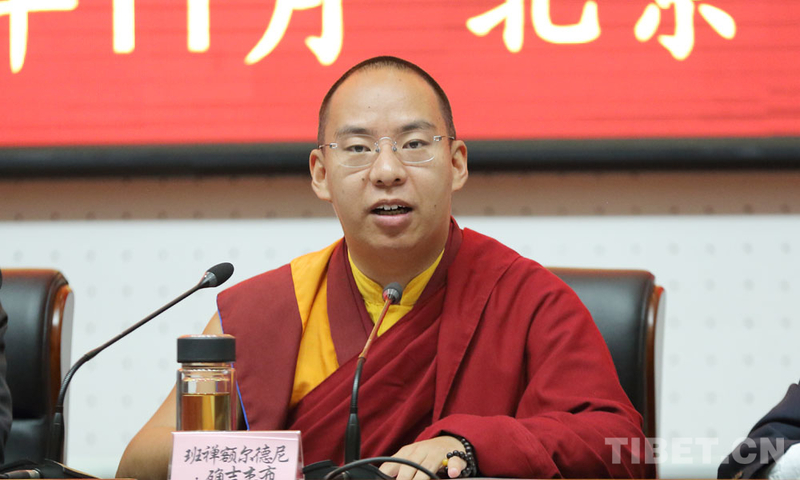 (TibetanReview.net, Nov13, 2018) – Tibetan Buddhism should adapt to the socialist society, blend with Chinese culture, and be compatible with China’s national conditions, Gyaltsen Norbu, the replacement 11th Panchen Lama appointed by the Chinese government, was cited as saying at the 2018 Tibetan Buddhism Doctrine Interpretation Seminar held at the China Tibetology Research Center, Beijing, on Nov 8. Gyaltsen Norbu, a member of the Standing Committee of the Chinese People’s Political Consultative Conference and a vice-president of the Chinese Buddhist Association, made the remark in his speech at the seminar’s opening ceremony, reported China’s online Tibet news service eng.tibet.cn/eng Nov 12. He has said that for this purpose, the Tibetan Buddhist community should act on its own initiative, have the courage to undertake its historical mission, adapt to the development trends of modern times, and comply with the developmental (trend) of the country. Gyaltsen Norbu was, of course, calling for compliance with China’s ongoing national discourse on the sinicization of religion policy with the zeal of an activist. The report noted that “The Tibetan Buddhism Doctrine Interpretation Seminar” had been held for eight consecutive years since 2011. The theme of this year’s two-day seminar was stated to be “Tibetan Buddhism and Honest Thought”. A number of guests were stated to be scheduled to give “speeches that integrate their own experience from and feelings of Buddhist practice, theoretical research, and practice at the forefront in the fields of Buddhism”. Kindly note readers, Tibetan Review calls this man a “Replacement 11th Panchen Lama”. However, according to Tibetan customs and tradition he is not a “Rimpoche”. He is an ordinary man picked by China, a stooge. And by TR putting his information on front page, so to speak, is like promoting China’s propaganda and white-washing the disappearance of Gedhun Choekyi Nyima, the true 11th Panchen Lama. I believe most people who would visit this news site already knows the background of China and the Panchen Lama. Should make it obvious that his status is suspicious. We should not fault TibetanReview for trying to balance at least a little objectivity. Especially since the assumption that the Tulku system (and Gelug lamas) represent all Tibetans, and are not controversially chosen anyway (The Karampas) is not correct either. I wish they put more details and analysis into their articles. This is no more useful than a short AP news wire. But lack of extra context is their only fault. In my humble opinion, what China should be aiming for is to ensure the continuance of the intention of the Nalanda academic tradition of Buddhism, which has evolved purely always with the aim to ensure that the most complete and accurate teachings of the Buddha Shakyamuni remains firm within this world. That would require at least one government sanctioned and supported institution to be established where students could follow the highest academic principles in their pursuit to furthering the Buddha’s tradition of hearing, rigorous reflection, and perfect practice. From there the most highly trained and disciplined teachers could be disseminated throughout China where they would provide community education programs, specifically instructing citizens in the benefits of living a wholesome and correct human life. For centuries Tibetans have striven to perfectly preserve and continue the Nalanda tradition. The highest academic standards of study and practice have been demanded and achieved. This is the reason the tradition remains in its purest of form today. Technology offers many new opportunities to disseminate Buddhist principles to the wider community. Television channels featuring Buddhist themed programs could be established, eg., documentaries, dramas, educational series, etc. If more people can be encouraged to live truly virtuous lives in service to their families and the wider community, then the entire nation and the world can only benefit, therefore fulfilling the prayers of all the great Lamas, both past and present.